Are they coming for your daughter next? 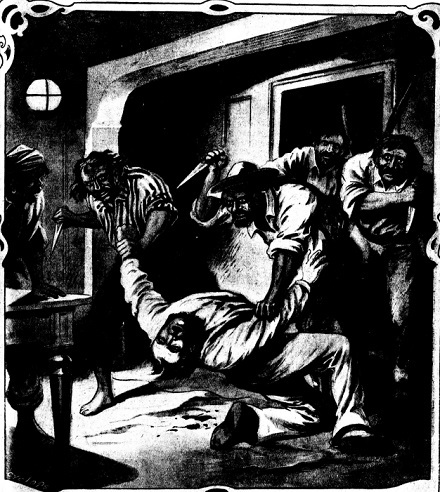 Cover illustration for the “penny dreadful” Police Crimes. Once away, he made for Montevideo and presented himself and his shocking story to British authorities. His 13 former mates, many of whom were pretending to have escaped the wreck of an American guano freighter with an eye to hitching on with some other crew and vanishing into the circuits of imperial trade, were soon recognized or rounded up. By December, all 14 survivors were en route to England. Those prosecuted, strangers in a foreign land, do not appear to have made any declaration explaining their own conduct even after sentence was secured though the London Times (Feb. 23, 1864) said that they had communicated to their gaolers that they had been driven to desperation by a mean water ration in the tropical swelter. One British newsman reporting the hanging also marked the omission in a voice that, however tinged with racial condescension, empathizes surprisingly with the hanged. Nothing can extenuate the ferocity of the group of murders they committed, for the lowest savage is bound to observe the instincts of humanity. But God judges provocations, and weighs the frenzy of ignorant men, goaded to crime, in a finer balance than any earthly one. He knows what secrets are gone down with the Flowery Land, and the dead bodies of her captain and mate; knows whether these five men — now also dead — were treated as it is the custom to treat such poor sweepings of maritime places. The evidence hinted strongly at something of the kind — foul water to drink, and little of it under the tropics, insufficient food, and anger and blows; because, having shipped his crew from Babel, the captain and officers could not understand them or be understood … with decent management this kind of tragedy is next to impossible. Had the crowd at the execution been of the same color and vocation as themselves, sympathy would not have been wanting. It would have been believed — justly or not — from the experience of a hundred miserable voyages, that, knowing no Spanish, their officers had made kicks and cuffs interpret for them, as is the case in many a vessel. If it was so in theirs, how could they explain it? Our language, our courts, our long delays between crime and its penalty, were to them all one mystery. They are of a race that prefers to die and be done with it, rather than to fret and fuss too much against the will of Fate; and though we believe that none of the five were guiltless, we have an uncomfortable suspicion that, had they been English, some different facts would have been brought out at the trial … let us not be suspected of pitying a dusky murderer while we have no compassion for his victims of our own color if we demand that the moral of this offensive sight should be drawn in Manillese as well as English — that captains should learn to treat their lascar like a human being, if they would not have his thick Oriental blood boil into the fury of the brute which they have helped to make him. The five pirates have died that horrible death by which it is still believed evil natures are terrified from crime, and society edified as to the sacredness of human life. We wish that we could think so in view of that surging, blasphemous, excited crowd that treated the occasion as a drama of the liveliest sensational kind — with nothing to pay for a place — and homicide, not fictitious, but natural and authentic, perpetrated before their eyes. In grimy, haggard thousands, the thieves and prostitutes of London and the suburbs gathered about the foot of the big gallows, jamming and crushing each other for a share of the spectacle. … The accounts of the demeanor of the crowd answer the question, whether it is good to gather for such a sight the scum and dregs of a vast city. Coarse, heartless, bestial, and brutalised by the official manslaughter which they had witnessed, the drabs and pickpockets made a “finish” of it in the public-houses, canvassing the skill of Jack Ketch and the “gameness” of each of his swarthy patients. The hideous roar that went up at the various stages of the sight was not the expression of gratified justice: it was the howl of the circus at the smell of blood — the grunt of what is hog-like in our nature at suffering we do not share. … Let us dismiss this devilish carousal of agony on one side, and eager excitement on the other, with its accompaniment of brutality and disorder ten times aggravated, and ask whether such a sight was wisely furnished, since we cannot call in question its jutice, so long as blood is purged with blood and a Mosaic law governs a Christian nation? * Since barques could be handled by a small crew, they had carved out a large slice of the world’s shipping lanes in the Golden Age of Sail … right before steam power showed up and relegated them to the sideline. † One possible way to interpret the evidence is that the first mate Carswell was the brutal overseer. In a deposition that Taffer only passingly alludes to during his Old Bailey testimony, he described how Carswell thrashed John Carlos when the latter, citing sickness, refused to take his turn at the watch, and even lashed Carlos to the mast. The captain arrived a few minutes later and had Carlos untied and sent back to berth, with medicine. The mate is also the man to whom Taffer attributes some “corrective” beatings with ropes. One can at a stretch imagine what occurred on September 10 as an attempt “only” to murder Carswell, perhaps then to attribute his absence come morning to some mysterious nighttime accident overboard — but that the personal settling of scores mushroomed into a full-blown mutiny when the captain presented himself and the logic of the situation required his destruction, too. Taffer said that the mutineers had to confer among themselves where to make him steer the ship they had taken possession of, perhaps corroborating a more improvised series of events. This, however, is an entirely speculative reading; there is plenty of other evidence to suggest intentional coordination.